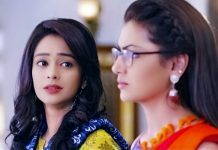 High Points in Kumkum Bhagya Kundali Bhagya. Kumkum Bhagya: Abhi gets the DNA report and gets happy reading that Kiara is his daughter. He comes to meet Pragya happily in the morning itself. King sees him there and is surprised. 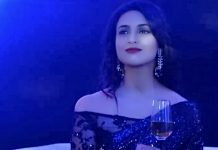 He tells that Chachi had told him that he comes to his house in his absence, but he scolded her saying Abhi is his friend and will not do this with me. He tells that he didn’t believe her, but he didn’t know that his friend comes to his house, not to meet him but his wife. He talks to me, but he has his eyes on her. Abhi looks on. King says you talk about friendship and have soft feelings for Pragya. Abhi tries to explain to him, but King angrily tells that he doesn’t want to hear anything. He asks do you have feelings for Pragya. He asks him to tell just yes or no. Abhi confesses to him that he has feelings for Pragya. King gets upset with Abhi. Kundali Bhagya: Prithvi jumps inside Kundra house through the window. Shristi hears the noise and looks at the opened window, but she ignores her doubt. Prithvi hides in Shristi’s cupboard. Preeta comes and asks for the towel. Shristi asks her to take it from the cupboard. Preeta opens the cupboard, but don’t see Prithvi and Shristi gives her towel kept there. Prithvi gets scared. Shristi tells Dadi that she doubts that the thief entered in the house. Raja Beta: Vedant and Purva have an argument. She blames him for not understanding her feelings and says if you had loved someone then maybe have understand her feelings. Vedant hears her silently. He keeps some papers beside her bed with a letter and money and leaves from the hotel room. Purva wakes up in the morning and reads his letter in which he has written that he has left train ticket and some money, and beside it, is an envelope. He knows that she takes her own decision and that’s why the decision about the future is hers. He asks her if she wants to return back to him then tear the marriage annulment papers kept in the envelope else live the life the same way she wanted to. Purva signs the annulment papers and is in dilemma.